The records of the trial of Gaius (sometimes spelled Caius) Verres reveal--far better than any other extant source--the corruption of the last years of the Roman Republic. Through a series of orations and witnesses, Verres's prosecutor, Cicero, presented a powerful story of how the shocking greed and arrogance of a provincial governor wreaked havoc on what had been the breadbasket of the Roman Empire, Sicily. In his successful prosecution of Verres, Cicero both demonstrated the talents that would make him one of Rome’s foremost politicians and set in motion events that bring an end to the senatorial oligarchy established by the Sullan constitution. A word of caution: what we know about Gaius Verres comes to us from Cicero’s seven trial orations. No records of the speeches by Verres’s defense attorney survive. Nor do we have from Verres himself any explanation for his behavior. There is the possibility, of course, that Cicero, as prosecutor, might have exaggerated the extent of Verres’s abuses, or that he might have omitted information that could have put Verres's actions in a more sympathetic light. The mountains of evidence presented by Cicero leave little doubt, however, that Verres was indeed a very despised and unscrupulous official. If he wasn’t the worst governor that a Roman province was ever made to suffer, he surely ranks right up there. Gaius Verres was born around 114 B.C. to a father of senatorial rank who also, according to Cicero, was a practitioner of corruption, though not on the scale that his son would achieve. Nothing is known of his mother. Of his early life, we have only Cicero’s hints that Verres, like most of the young aristocrats of his time, led the easy life of a voluptuary. Almost certainly, however, Verres acquired in the process a liberal education that inspired the lust for fine art that would become an obsession during his governing years. Gaius Verres took his first official post in 84 B.C. with his election to the office of quaestor. Stationed with the army of consul Papirius Carbo in the Gallic province, Verres probably embezzled hundreds of thousands of sesterces, the first of a long series of crimes. Verres served as quaestor until 82 B.C. The following year, Cornelius Dolabella, a first-rate plunderer and the new governor of the province of Cilicia, named Verres as his legatus. The position allowed Verres to begin indulging in his passion for collecting great works of art. Verres stripped temples of statues and pictures. Verres’s passion for collecting women (despite his having a wife, daughter and son) equaled his interest in collecting art. The lust and cruelty of the legate were on full display in Lampsacus where Verres, in the course of a journey, Verres asked his assistants to determine whether there were any virgins "worthy" of extending his stay. Rubrius, an assistant to Verres who specialized in such matters, informed him that a particularly lovely girl resided at the home of her father, Philodamus, one of the town's leading citizens. In a plot to gain access to his comely target, Verres insisted that Rubrius be lodged at the home of Philodamus. In a display of generosity he came later to regret, Philodamus hosted a banquet for his guest, allowing him to invite whomever he pleased. Rubrius invited the companions of his master. After the dinner party had put down several glasses of wine, Rubrius asked Philodamus, "Why do not have your daughter summoned to us?" Philodamus replied that it was not the custom of Greeks to have women dine at the banquets of men. Rubrius then ordered his slaved to close the door and guard the house. With tensions escalating, Philodamus gave orders for his servants to defend his daughter and to inform his son of the crisis. In the ensuing fight, Rubrius severely scalded Philodamus with boiling water. Philodamus's son and many other townspeople, having rushed to the home to defend the daughter, became involved in the melee. In the end, a number of the slaves of Verres were wounded and his lictor, Cornelius, was killed. Narrowly escaping an angry mob, Verres fled Lampsacus and began plotting his revenge. Verres succeeded in getting Philodamus and his son charged with the murder of his lictor. Despite the compelling evidence that the murder was justified, Verres (and Dolabella) persuaded a vacillating Caius Nero to stack the jury against the defendants and secure their convictions. Philodamus and his son were executed in the marketplace of Laodicea for the crime of defending a young girl's honor. [I, 64-75]. With the death of Dolabella’s quaestor, Verres got a promotion. His new as proquaestor provided prime opportunities for plunder. Verres seized money from estates and gathered more riches through imposition of an arbitrary system of levies. When Dolabella returned to Rome in 78 B.C., his wholesale extortions became the subject of a criminal case. Verres landed feet up by turning state’s evidence, while Dolabella was convicted and sent into exile. Little is known of the four years in Verres’s life from his return to Rome to his assumption of the city praetorship, a judicial office, in 74 B.C. Cicero charged that Verres won election to the post by paying 300,000 sesterces to professional bribers. The responsibilities of specific praetors were determined by lot, and the luck of the draw landed Verres with jurisdiction over civil litigation between citizens, a position ripe with opportunities for graft. Through edicts and manipulation of inheritance laws, Verres got richer and left the poor poorer. Verres further enriched himself by accepting bribes for approving work on public construction jobs. One notorious example cited by Cicero concerned a contract for repair of the temple of Castor and Pollux on the forum. By finding that the repairs failed, even in some small way, to meet the terms of the contract with the city, Verres could extort money from the contractors as the price for signing off with his approval for the project. Unfortunately for Verres in the case of the temple, the repair work was performed very well. In a visit to the temple, Verres was unable to turn up anything wrong. In Cicero's account, one of Verres's "Dogs" (assistants in plunder) offered the helpful suggestion that "almost no column is absolutely perpendicular" and suggested a rigorous testing of every column in the temple with a plumb-line, despite the fact that such testing was neither customary, required by the contract, or necessary to ensure the building's engineering integrity. With this pretense for rejecting the repairs, Verres demanded a bribe from the contractors. The 200,000 sesterces offered by the contractors were rejected by Verres and he re-let the repair contract to another contractor on the ground of non-performance. The contract was awarded to a colluding contractor for 560,000 sesterces. The "repairs" to the ever-so-slightly non-perpendicular columns were easily made and Verres, in a final blow to the original contractor, ordered that he furnish the funds for the cost-inflated second contract. In 241 B.C., at the end of the First Punic War, Sicily became the first province of Rome. (A province was the largest administrative and territorial unit in the Roman state.) A code of regulations enacted in 131 B.C., called Lex Rupilia, determined governance for the province. Sicily was divided into a western district (the district of Lilybaeum) and an eastern district (the district of Syracuse), with one quaestor provided for each district. Cicero's service as quaestor for the Lilybaeum district in 75 B.C. earned praise from local citizens and would directly lead to the decision of Sicilians five years later to support his selection as prosecutor of Gaius Verres. Sicily served as an important naval base, produced such abundant crops to be called the granary of the empire, and contained thousands of valuable statues and other art treasures. The island suffered through slave wars from 135 B.C. to 100 B.C., but for the next three decades, until the arrival of Gaius Verres as propraetor, enjoyed a period of peace and prosperity. Governorship of the provinces was determined by lot from among the city praetors. When the plum province of Sicily fell to Verres, he wasted little time in setting out from Rome. Accompanied by his son, Verres landed in 73 B.C. at Messana, the Sicilian city closest to present-day Italy and the city that would benefit most from his arbitrary policies and amassing of wealth. Over the next three years, Verres would violate the public trust in just about every way it can be violated. The precise chronology of his abuses is impossible to determine because Cicero grouped his charges by category rather than in the order in which they occurred. To adopt Cicero's categorization, Verres's crimes included: (1) misuse of his judicial prerogatives, (2) extortion involving imaginative use of agricultural taxes, (3) seizure of both public and private statues and other works of art, and (4) naval mismanagement and use of unauthorized punishments. Normally, a term as praetor lasted only one year, but Rome's preoccupation with a slave war and the untimely death en route to Sicily of an appointed successor, gave Verres three years instead of the usual one to exploit the province. Relatives of any wealthy Sicilian who had the misfortune to die during Verres's terms as praetor found Verres scheming to get a slice of the decedent's pie, despite inheritance laws that would have seemed to stand in his way. Through the appointment of subservient judges, Verres obtained rulings that sent significant shares of substantial estates his way. In one case, Verres's judges ruled that an heir failed to erect statues in the precise manner specified in a will, resulting in the forfeiture (ostensibly to the city of Syracuse, but in actuality to Verres) not only of the estate, but the heir's other property as well. Litigants quickly found out that justice came at the price of a bribe and judges who failed to play the game as Verres wanted found not just their jobs, but their lives as well, in danger. In some cases, favorable verdicts were blatantly auctioned, with Verres greedily taking money from both parties. Cicero's catalog of Verres's judicial abuses included falsifying judicial records to hide his abuses, rounding up and presenting perjuring witnesses, rigging the selection of priests, and transforming elective positions--such as that of censor (or tax assessor)--into appointive positions available to the highest bidders. Sicilian cities, too, became victims of Verres. He ordered them to provide funds for the erection of public statues. Some were actually built, and many of those turned out to be likenesses of himself. (Later, when Verres's fortune turned, many of these same statues were torn down, in scenes probably not unlike those centuries later when crowds in Moscow and Baghdad would pull down statues of Stalin and Saddam Hussein.) Others were never erected and the funds simply captured by the governor. No crime of Verres more outraged Sicilians than did the governor's abuse of the peculiar system of agricultural taxation. Under the system of land taxes employed in Sicily (as well as Sardinia, but in no other provinces), annual tithes (decumae) were levied on crops, primarily wheat and barley. The larger the crop, the larger the tax. 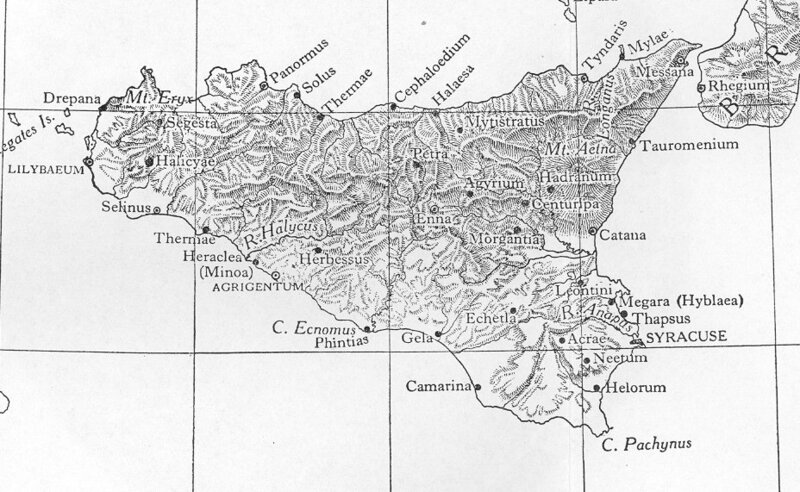 Farmers in each Sicilian community declared the amount of their land and the amount of seed sown, and based on these figures, a decumae for the whole district was sold at a market in Syracuse to the bidder who offered the most bushels--an amount the bidder was required to send to Rome. Thus, if the crop exceeded expectations, the bidder won. If it did not, the bidder lost. The risk was his, not Rome's. The system had worked well for farmers and for Rome. Verres's chief of the decumani was Apronius, a man Cicero says "whom Verres considered most like himself of any man in the whole province." Verres, essentially abolishing a system that had worked so well, issued an edict conferring on his chief collector the power to set tithes at whatever rate he deemed appropriate. Judges were empowered to enforce the tithes, with a four-fold penalty established for non-compliance. The net effect of the edicts, of course, was more money for Verres and his key supporters and less for the farmers. When resistance to arbitrary orders of the tax collector surfaced, the threats were mercilessly put down. Cicero cites the case of Q. Septicus. Septicius refused to accede to the decumae levied on his grain. In a first special edict, Verres ordered that no farmer could remove the grain from his threshing-floor until he had satisfied the demands of his tax collector. Septicius, a stubborn Roman to be sure, decided to leave his grain on the the floor and allow it to be damaged by rain rather than pay what he considered to be an excessive levy. Verres responded with a second edict requiring grain to be delivered to the coast by August 1, thus forcing Septicius to choose either pay the demanded decumae or violate one or the other of the two special edicts. According to Cicero, Sicilian farmers (aratores) considered themselves lucky if they were not forced to pay more than three times the tithe to which they were legally liable under the former regime. Some farmers were called upon to furnish more grain than they actually raised and, as a result, fled or committed suicide. Many aratores found that they could no longer make it, and lands that had been cultivated for generations were abandoned. The district of Agyrium saw a drop in the number of aratores from 250 to 80, and 50% to 75% declines in the number of active farmers was common in other districts. After three years with Verres as provincial governor, the former breadbasket of the empire was barely able to feed its own citizens. Verres's praetorship in Sicily also afforded him numerous opportunities to add to his already impressive collection of art. What Verres wanted, he generally got. Although Cicero, in his trial orations, suggested that Verres's preference for Greek works over Roman showed him to be a man of poor taste, this should be taken as an attempt to appeal to the jurors' prejudices. (Romans of Cicero's time had a low regard for all things Greek.) In fact, the record of his art seizures shows Verres to have very good taste indeed. Verres arranged to have his booty of art sent to a store-house in Messana. (The size of the collection necessitated construction of a ship, built at public expense, for the purpose of transporting it to Rome for his later enjoyment there.) Statues, tapestries, gold rings, decorated goblets, and fine furniture all became found their way to Verres's store-house. Any Sicilian with art that caught Verres's eye was likely to lose it. Henchmen of the governor, called his "Dogs," combed cities and villages in search of pieces worthy of seizure. Verres was not even above taking silver plate from a Sicilian who hosted him for a banquet and who made the mistake of laying his finest possessions on the table. In Haluntium, located on a steep and rugged coastline, Verres, while "lying in his luxurious litter," summoned a leading citizen of the town and ordered him to immediately gather all the embossed silver and Corinthian bronzes of residents and cart them town to the shore, where he might inspect them. Valuable ornaments (emblemata) were removed from the assembled loot and the vessels were returned to their owners, along with token payments, which most owners refused to accept. The ornaments torn from the possessions of provincials in Haluntium and elsewhere were sent to hired artists in Syracuse, who reset them on golden vessels the praetor furnished for that purpose. Verres, immensely interested in his artists' work, spent hundreds of hours observing the re-creation of his treasures. One victim of Verres's avaricious ways was Heius, who owned one of the most lavishly adorned homes in Messana. Heius's residence, Cicero tells us, was something of a tourist attraction. The residence's private chapel featured four beautiful figures, including a marble Cupid which once adorned the Forum at Rome, a bronze Hercules, and two other bronze statues. Verres removed the four figures from Heius's chapel, handing Heius a trifling sum (6,500 sesterces) in return to suggest the fiction of a purchase. (No matter that purchases by provincial governors were unlawful under Roman law.) As a wealthy man, Heius had no interest in selling the most prized possessions of his home--and Heius testified at trial that he never would have sold the objects for any amount. Two other individuals to lose their most prized works of art were princes who, in 73 B.C., were on a journey from Rome to Syria to claim the throne of their dead father. The dead king's sons stopped in Sicily, where Verres invited them to an elaborate banquet. The princes returned the favor, and over the course of the evening showed Verres their treasures. Verres had learned through his sources that the prize of their collection, a magnificent candelabrum of gold, encrusted with gems (and destined for the temple of Jupiter in Capitolinus) was being kept in secret. He prevailed on the princes to bring the candelabrum to his house, where he might inspect it, while keeping it safe from the prying eyes of the public. When attempts were later made by the prince's servants to retrieve their treasure, Verres kept putting them off. Finally, a direct request by the princes for the object's return was refused, Verres proposing instead that it be presented to him as a gift. Unsurprisingly (especially given the religious significance of the candelabrum), Verres's suggestion was refused. The princes were ordered to leave the island before night, ostensibly because "pirates from his kingdom [Syria] were coming against Sicily." The leading city of Syracuse paid an especially heavy price in the form of lost treasures. The port city's temple of Minerva was stripped of wooden panels containing magnificent calvary battle scenes, gold and ivory carved folding doors, large bamboo spears, and a fine Gorgon head. Statues disappeared from the town-hall, the temple of Jupiter, the shrine of Libera, and the sanctuary of Aesculapius. Verres's men removed so many bronze bowls and marble tables from temples that Syracusan tour guides were reduced to describing what had been removed from each place rather than what was there to be seen. Cicero's final oration against Verres focused on his indolence, his naval mismanagement, and his use of unauthorized punishments. Collectively, the incidents reported by the prosecutor paint a very damning picture of the praetor. Some of Cicero's remarks skate past the edge of relevance and were clearly designed to prejudice the jury. For example, Cicero describes a garland-adorned Verres being borne around the city of Syracuse like an oriental monarch on a litter containing a cushion of Maltese linen stuffed with roses. In his summer camp at the entrance to the harbor, he was reported by Cicero to have had liaisons with large numbers of the most beautiful women Syracuse had to offer. On his breaks from sexual encounters, Verres ran up "enormous losses" at gaming tables. While Verres fiddled, Cicero alleged, ships burned. Pirates roamed the Mediterranean in search of opportunities for exploitation. The pirates hit a bonanza off the coast of Sicily when they encountered an unprepared Sicilian fleet led by a cowardly commander appointed by Verres not for his naval expertise, but simply to get him out of the way so the governor could better enjoy the commander's beautiful wife. The commander, Cleomenes, took off on the fastest and best staffed ship in the fleet, leaving the other five vessels to be captured and burned. When news of the disaster at sea reached Sicilian citizens, an angry mob gathered around the governor's residence. The pirates did a taunting victory lap around Syracuse harbor while the citizens watched helplessly from shore. Verres understood that the disaster might lead to his prosecution, and that the captains of his ships (except Cleomenes) could be powerful witnesses against him, so he forced them all to sign false affidavits casting the blame in other directions. Then for good measure, fifteen days after the fiasco, he had the captains arrested and charged with treason. They were tried before a biased tribunal (which included Cleomenes), convicted, and executed. On another occasion, when the provincial navy did manage to capture a pirate ship containing a cargo of slaves, coined money, fine tapestries, and silver plate, the governor ordered all the booty brought to him. Under Roman law, the captain of a pirate ship was to be immediately executed, but Verres (most likely because of a bribe) instead had the captain escorted to interior town of Centuripae, where the captain was given every comfort. Ignoring a law that required the entirety of a pirate crew faced at one place and time, Verres instead separated the young and handsome pirates from those (the old or ugly or infirm) who he deemed of little value. The younger skilled pirates were distributed to his secretaries, his son, or kept for himself. The pirates of lesser value were executed in small parties at various times. The citizens of Syracuse, anxious to see justice done with the pirates, kept score of those executed, comparing the number of pirates executed to the known size of the ship's company. When a discrepancy became apparent, many citizens began to demand execution for the full company of pirates. Verres attempted to quell the unrest by having his henchmen round up Roman citizens in stone quarries (generally refugees from Spain), cover their heads with veils, and lead them out to be executed-- supposedly as the unaccounted for pirates. Finally, to the long list of Verres's misdeeds, Cicero added simple and vindictive cruelty. As an example, he offered the case of C. Servilius, a trader from Panormus. Servilius incurred the wrath of Verres by publicly criticizing some of the scandals of his administration. The governor brought trumped up charges against Servilius, apparently alleging that the trader had fraudulently taken property belonging to the goddess Venus. After pleading not guilty, Servilius was ordered by Verres to post a bond. When Servilius refused to pay the bond (or, more precisely, to enter into a sponsio), he was beaten by six of Verres's lictors, who also scourged him across the eyes. Servilius soon afterward died from his injuries. Soon after Verres departed Sicily in 71 B.C., representatives of the island province appeared in Rome to file a formal complaint against their former governor. Plaintiffs came from all major cities in the province, except for Syracuse (the governor's residence) and Messana (Verres's store-house and a beneficiary of his plunder). Since the enactment of Lex Calpurnia in 149 B.C., Roman law allowed the provincials to bring an action de Repetundis against officials for extortion. If convicted, officials could be banished and ordered to pay up to 250% of the amount proven to have been extorted. By joint resolution, the Sicilians asked that Cicero, who they remembered fondly for his fairness while serving as quaestor in Sicily's western district five years earlier, be appointed as prosecutor for their action. The case presented great opportunities for thirty-six-year-old Cicero. First, it allowed Cicero to match his oratorical skills against Verres's defense attorney, Quintus Hortensius Hortalus, the acknowledged "king of the courts" and a man Cicero called "that great pleader and friend" of Verres. Second, it offered the senatorial prosecutor, himself a product of the Roman middle class, a chance to attack, in the name of aggrieved provincials, the corruption of a tottering aristocratic oligarchy. In 70 B.C., the case against Verres fell to a judge who Cicero considered beyond reproach, M' Acilius Glabrio. Glabrio's term as praetor urbanus ended on December 31, 70 B.C., and thus a major part of the defense strategy in the case became delay. Hortensius and Verres believed that on January 1, 69 B.C. a new, much more corruptible judge would take over the case, if only it could be extended that long. The first tactic of the defense, however, was to arrange for a sympathetic plaintiff in Sicily to propose a straw-man prosecutor, a former quaestor (and accessory) of Verres named Q. Caecilius Niger, to take the case instead of Cicero. Under Roman law, prosecutors were not provided by the state but were instead selected by plaintiffs. Putting forward another potential prosecutor willing to throw the case provided Verres with an early opportunity to effectively win his case. The proceeding before a jury to determine which of the two would-be prosecutors would actually take the case was calleddivinatio. On about January 15, 70 B.C., Cicero delivered a powerful speech (Divinatio in Q. Caecilium) outlining the reasons why he, and not Caecilius, should prosecute the case. Cicero argued that the vast majority of Sicilians preferred him to Caecilius (in fact, many Sicilians had made it clear that if Cicero were not their prosecutor, they would not appear as witnesses), that he--unlike Caecilius--had no conflict of interest, that Caecilius lacked the skills to be an effective prosecutor, and that he more intimately understood the ways in which Verres had victimized the provincials. Although the proceeding helped the defense by delaying the start of the trial, the outcome could scarcely have been doubted. Cicero was chosen as the prosecutor. Cicero's first move as prosecutor was to formally charge Verres with the extortion of forty million sesterces from Sicily and to ask for penalty of one hundred million sesterces, the maximum allowed by law. Cicero then moved for a 110-day adjournment to allow him time to travel to Sicily and gather affidavits and other evidence for the prosecution. The adjournment was granted, and Cicero immediately began making plans for his trip. The adjournment afforded the defense a chance to employ its second delaying tactic. The day after the Verres case was adjourned, Hortensius managed to find a partisan of Verres who levied an extortion charge to be levied against a Roman governor for the Macedonia, and then asked for a 108-day adjournment to May 5. The move put the second case one day ahead of the Verres case on Glabrio's calendar. On January 31, accompanied by his cousin, Cicero landed at a western port of Sicily and began a period of extensive evidence gathering. For the next fifty days, he traveled to all the major cities, as well as many of the smaller villages, of the province. He copied public records and interviewed farmers and other victims of Verres's avarice. Except in Verres's favored city of Messana, the public enthusiastically greeted their prosecutor and provided the desired assistance in building the case against their former governor. In some cases, they did so despite threats from Sicily's new praetor, Mellatus, who generally supported his predecessor. His work done, Cicero sailed from Messana, making his way back to Rome by March 8th. For the next few months, two major tasks occupied Cicero. First, he sifted through and organized the mountain of incriminating evidence against Verres that he had gathered on his travels. (He also took the time in March to reject an attempted bribe by Verres.) Second, he campaigned successfully for the office of aedile, a position filled by voters in a July election. While the other extortion case was dragging on, jury selection went ahead in the Verres case. Fortunately for Cicero, the empaneled jury turned out to be a largely incorruptible group of men, frustrating Verres's hopes of using bribes to obtain an acquittal. Cicero commented on Verres's plans, wryly noting that his provincial victims might have been better off if Verres hadn't felt the necessity to plunder enough to be able to set aside funds for bribing jurors and judges. By mid-summer, it was clear that if the case could be stretched into the next year, it would fall to a partisan of Verres. The fall would be taken up by a series of festivals and games, requiring court adjournments of over forty days. Cicero recognized that by presenting the case as he might have wished, he ran the risk of having the case determined by an unsympathetic judge. "I declare that Gaius Verres has not only committed many arbitrary acts, many cruel ones against Roman citizens and the provincials, many wicked acts against gods and men, but in particular he has taken away forty million sesterces out of Sicily contrary to the laws." With his opening speech concluded, Cicero immediately called his first witness. Sicilian after Sicilian took the stand over the next nine days of the trial, collectively leaving little doubt about the extent of the praetor's corruption. Verres could only endure three days of the spectacle, then claimed illness and stopped attending court. It became increasingly apparent do Hortensius that he could do little to save his client and his objections to testimony became less frequent. "Verres had been only a type. He had stood for the whole corrupt system. It was for more than the condemnation of one man that the orator had striven, and the outcome of the great trial was the death-knell of the power of the Optimates. Cicero's singleness of purpose, his devotion to duty, his skill in foiling the most cunning moves of a determined opposition had borne fruit, and he was well content." Verres remained in exile in Massilia for the last twenty-seven years of his life. Some of his plundered treasure went with him, and in 43 B.C., Antony demanded that he return some of his Corinthian vases. When he refused to comply, Verres, then seventy, was summarily executed. Cicero's fame as an orator, versatile mind, politician and statesmen grew after the trial. Cicero became praetor in 66 B.C. and in 63 B.C. he was elected Consul. During his year as Consul, he thwarted an effort to overthrow the Roman Republic led by the patrician candidate he had defeated for office, Lucius Sergius Catalina (Cataline). In 61 B.C., Cicero rejected an invitation from Julius Caesar to join his triumvirate. In 50 B.C., forced to choose between supporting Caesar or his adversary Pompey, Cicero sided with Pompey. With the Pompeian forces nearly crushed, Cicero and Caesar entered into an uneasy but workable relationship. Cicero took no part in the assassination of Caesar on March 15, 44 B.C., but later expressed his satisfaction with the "that most glorious banquet on the Ides of March." Following Caesar's death, he and Mark Antony became the two most powerful figures in Rome. Through the use of well-placed alliances, Antony outflanked Cicero, identified him as an enemy of the state, and became his hunter. Assassins caught up with Cicero on December 7, 43 B.C. as he left his villa in Formiae in the hopes of catching a ship to Macedonia. He was decapitated and his head was placed on the Rostra in the Roman Forum.